We were really excited to experience the Amazon basin and decided to do it in the Pacaya Samiria Reserve near Lagunas, Peru. Its on the way to Iquitos and is an immense national reserve that doesn’t get the attention it deserves. Navigating this part of Peru needs a lot of time and patience. Timings are never quite what you expect – its all + or – half a day. Thats how this part of the world rolls. There is beauty in it and we learned to appreciate it in time. Pedro Ruiz to Yurimaguas – 50 soles/person in a/c bus. Buy tickets from travel offices on main road. Pedro Ruiz is a small town that is 2 hours from Chachapoyas and it is only from here that one can go to Yurimaguas. Now is about where you need to start going with the flow – stock up yourself with snacks, drinks and reading material and let the Amazonian world unfold around you at its own pace. Once we reached Pedro Ruiz, it was about 7 pm in the evening. The main road where you will get off the collectivo is lined with tourist offices and you can enquire for bus tickets here. Once you buy them, you will need to find a place to eat. One look at the dusty, remote town and I was sure there would be nothing vegetarian here. But Swami, ever the optimist, decided to ask. I had made up my mind that he would get recommendations for pasta or rice, but I was completely confounded when a local answered to S’s question: “vegetarian food? of course, walk that way and there is a restaurant.”. 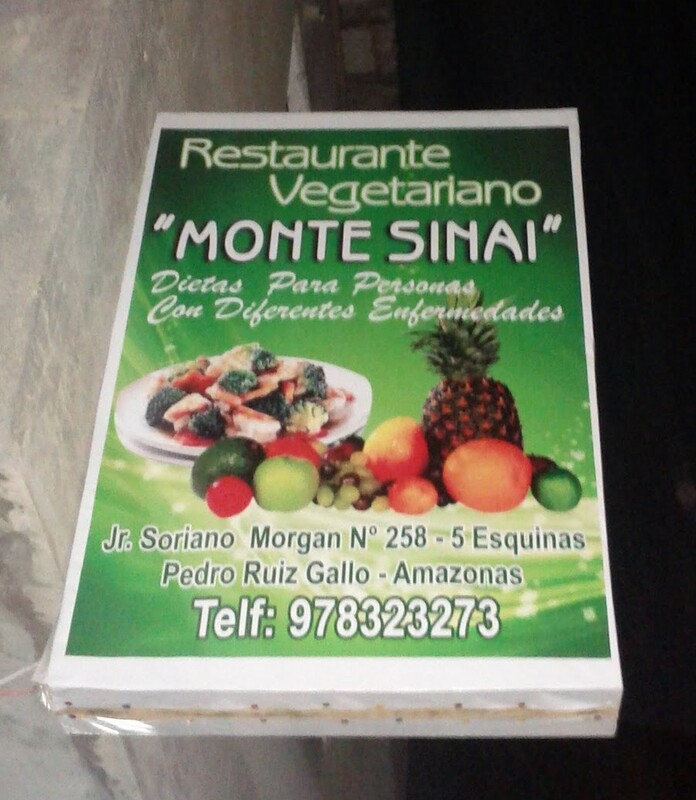 When I pressed him for the name of the resto, I got a reply “solo restaurante vegetariano”. Needless to say, we discovered that EVERYONE in that remote, Peruvian town, knew this place! I absolutely cannot remember how to get to this place. But I can tell you, if you find yourself in Pedro Ruiz, give yourself a chance and ask the locals where to find “Restaurante Vegetariano”. Update: I do have a picture of the restaurant, absolutely go here! We boarded the bus to Yurimaguas, it cost us 50 soles each. It was really late and we ended up sitting next to the driver in the spare driver’s seats. I think they took the bunk beds right behind us. Once a few seats cleared up, we went back into the bus. The bus had a flat tire and we reached Yuri at least 5 hours late! Welcome to the Amazon. Yurimaguas is a river town and not a place for sightseeing. We checked into hotel Rio Huallaga, which is the river the town is situated on, as they had very inexpensive dorm beds that no one else was using. Very clean though! Yuri also has a nice chifa that looks the town’s only fine dining place. Just ask “Donde esta chifa grande, and someone will tell you”. For those who want to do an amazon jungle trip in Pacaya Samiria, Yurimaguas is the cheapest way to do it. It is much more expensive from Iquitos. From here, you will go by boat to Lagunas and there you will commence your Amazon basin jungle trip. We don’t actually see the Amazon river until we are in Iquitos, but this is the Amazon basin. Buy snacks (plenty of it) and some food for the boat trip to Lagunas next day. No vegetarian food on the boats. We packed tomatoes, avocado and bread and made our own sandwiches. ATM – the last ATM until you reach Iquitos. Get enough money for the Amazon trip, which costs ~100 soles/person/day. This was a great deal in 2011, so expect to pay more! Hammocks and a lunch box – you absolutely need a hammock. The boats do not come with hammocks nor do they provide plates/spoons for your food, if you choose to eat there. We bought hammocks and boxes for our food. Even if you plan to not eat, it is easy to keep things like bread or just get some rice. ← Chachapoyas – a hidden gem in Northern Peru!